It’s no wonder people spend so much money making sure the kitchen is in tip-top shape. This year’s mainstream kitchen design trends have been predicted, and they seem to lean toward eco-friendly. 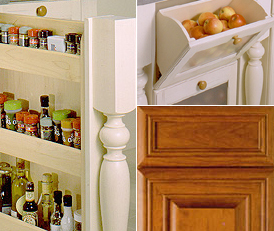 Wood-Mode, a leading manufacturer with locations across the country, can help update any kitchen. Wood-Mode has received the Environmental Stewardship Program certification and is committed to good environmental practices starting with the source of wood and continuing to the factory and office where they use sawdust and scrap wood as an energy source. When thinking green, people can focus on super-trendy styles with environmentally sustainable materials. While this approach means well, the materials will still enter the waste stream when the kitchen is out of date in a few years. Instead, sticking with traditional styles such as stained or painted cherry cabinets, from a manufacturer dedicated to responsible forestry practices, has much more staying power and will be enjoyed for many more years. Wood-Mode has introduced a line of reconstituted wood veneers for consumers who want the look of a rare-species wood. These veneers are manufactured to mimic wood that cannot be sustainable harvested. Instead, wood from responsibly maintained forests with fast-growing trees is used to create an identical product. This gives consumers a chance to bring an exotic look into their homes and maintain a green lifestyle. Whether building a new kitchen or remodeling an old, there are a wide variety of options for responsible design. This entry was posted in Green Design Trends and tagged Environmental Stewardship Program, green cabinets, green kitchen trends, Wood-Mode on March 8, 2010 by Carol Morgan. The kitchen is a great area to beginning building (or remodeling) an eco-friendly home. Since it is such a home focal point starting green there can eventually spread out to the rest of the home. Great tips! I agree that the kitchen should be the focal point of your home. I just completed my new kitchen a few months ago and went all green. The cabinets were the hardest to find, but in the end I went with Snaidero in Chicago. They have a new green kitchen that has toxin levels so low, it beats CARB standards. My family and I love our new kitchen so much that we eat in a lot more and I actually want to cook!